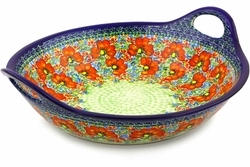 This oversized Polish Pottery Salad Platter is humble dinnerware ready to serve your salads. Or use this large stoneware bowl for mixing - it has tall sides to help keep sugar and flour inside. This bowl is beautifully decorated both inside and out and makes a stunning centerpiece. A great compliment to your polish pottery dinnerware set.